Many years ago, long before the earth knew pollutants of any kind, a range of volcanoes erupted - sending volcanic ash into the water of the ancient Sundance Sea that covered much of North America. The water in this sea evaporated, leaving behind a bed of mineral-rich bentonite clay. Near the small town of Redmond Utah, Redmond Trading Company extracts this ancient volcanic ash, now resting deep within the earth, and brings it to you in it pure, natural state. For external use - Mix the clay with water to make a gel about the consistency of mustard. The gel can be applied externally as a poultice on cuts, bruises, insect bites, bee stings, boils, rashes, acne and burns. It can also be used as a facial. [California Residents Proposition 65] WARNING [(California Proposition 65)]: This product contains trace amounts of lead, a substance known to the State of California to cause birth defects or other reproductive harm. I use it as a face mask with apple cider vinegar, the skin feel amazing after, less blackheads too. I feel like the jar is gonna last a long time!! I use this for an armpit detox once a month and I love how it performs, also for the price you get a lot!!! I've not yet used this as a mask yet, but it's defiantly on my list. I use this as a face mask and it really helps with my rosacea symptoms. The only downside is it's a bit of a pain to mix and messy to clean up. But I would recommend it for anyone who suffers from redness, dryness or sensitivity. I love to make a mask with this clay mixed with some essential oils. Keeps the skin clear and clean. I already use Earthpaste for my teeth and just began using this clay for my face. A small amount mixed with water and after washing, gets any remaining residue off. It also feels soft and isn't drying, which surprised me. No adverse reactions and I react to everything. A little goes a long way, so this jar will probably last me over a year. I started using Redmond clay to make our family toothpaste and the Hygenist was amazed at the condition of our teeth..."no plaque" and a very clean mouth. 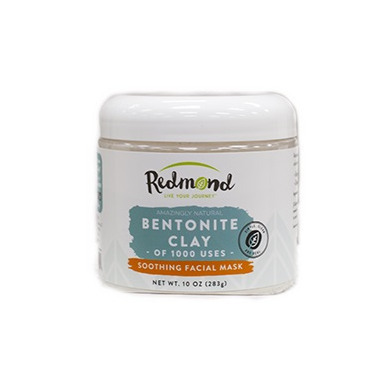 I put it down to the quality of the Redmond Bentonite clay. Great Product! Great product. Used it to make an all natural toothpaste. Mix with a little Apple Cider Vinegar for a moisturizing face mask. Really leaves my skin feeling nice and smooth! Made toothpaste with this, just like the earthpaste you can buy but way cheaper to make yourself. Kids love it! Helps my digestion. I will order again and it's great that I can use it in a bath and as a mask too! Works great as a mask if mixed with water or aloe vera gel. Leave on for about 10 mins while soaking in a relaxing bath. Excellent product. I used Redmonds clay for internal use for the heavy metals that where still in my body. After going through chelation therapy I felt that there must be a less aggressive approach without eliminating all your minerals at the same time with chelation. This was definitely a safer, cheaper solution then spending more money on chelation without having to loose other nutrients in the body. Highly recommend this product with those who are detoxing. For it to work you have to drink lots of water through out the day or you become constipated. I've used this as a facial mask and just love it! Leaves skin feeling incredibly smooth, soft and clean. Lots of other uses that I'm looking forward to trying. Highly recommended. We have been using this clay in baths, and it is wonderful. It is very versatile, and we are going to try some of the other uses very soon. Excellent product. I love this clay which I am using in place of baby/body powder. It is so smooth, and absorbs moisture keeping me feeling fresh all day!! There are many uses for it which I have yet to try. Pretty much solved my teens acne problem. Was used as a facial mask 2 x per week for 3 weeks and then 1 x per week thereafter. Great product! This review is based only on using the clay twice but so far so good. I bought the clay on the advice of my very favourite blogger, Jillee at One Good Thing by Jillee. She recommended it for the world's greatest relaxing bath. I must say it did add to my relaxing soak. It seemed to help pull the tension out of me and add to the calming effect of the bath. I need to use it a few more times to make sure this result is consistent but so far it is money well spent.